PRAKOTHARN MR. DENCHAI is a colorectal cancer patient stage III from Thailand. After recurrence of bloody stool in 2013, he underwent resection of colorectal tumor. In mid-2015, metastasis and recurrence occurred. In the CT-scan a tumor about 3.5cm*3cm was noted in his liver. After Nanoknife in St. Stamford Modern Cancer Hospital Guangzhou, his condition went well and under controlled, tumor marker has almost decreased to normal. Symptoms such as fatigue have also disappeared. And now, his tumor has lost activity. 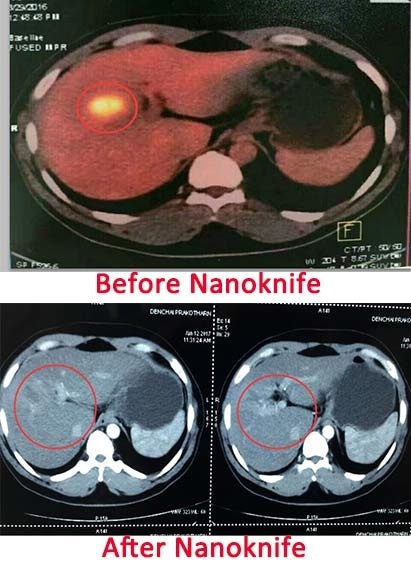 The successful completion of nonaknife for recurrence of colorectal cancer with liver metastasis means St. Stamford Modern Cancer Hospital Guangzhou has made great progress in the field of nanoknife, which will bring more new hope for the middle and advanced stage cancer patients.